This requires Acrobat Reader. Click here to download free, and follows steps 1, 2, and 3 on the Download Adobe Reader Free page. To read the Forward, click here. Then, send us your comments for our website. To read Chapter 1, click here. Then, send us your comments for our website. To read Chapter 2, click here. Then, send us your comments for our website. If you have stories to contribute on how you use the book ideas, click here to send them to us. Can A Girl Run For President? 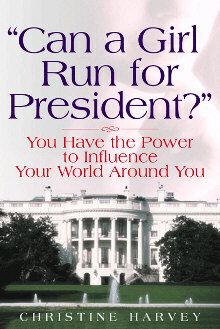 "You Have the Power to Influence Your World Around You"
This book, launched in the first Presidential election year of the new millennium, shows women how and why they need to develop their full potential as leaders in their fields and in the nation. The country is in dire need of resourceful leadership at all levels. US crime levels are the second highest in the world. The high school drop out rate is the highest of 21 industrialized nations. Math and science scores are 16th and 19th out of the top 21 nations. Every nation has it's own unique set of problems. Now is the time for women to step into the leadership gap. As women, we think we've come so far! But have we? Recently a 10 year old girl asked her teacher, "Miss Smith, can a girl run for President of the United States?" This everyday guide helps women of all ages to unleash the goldmine of value driven leadership in themselves and others.